On Thursday, the House Agriculture Committee released its draft of the Farm Bill. As expected, the nutrition title of the measure, which includes the SNAP program (food stamps) has garnered the most attention. For background, see FarmPolicyNews updates from March 15th, March 27th, March 29th, and April 10th. Washington Post writer Caitlin Dewey reported late last week that, “House Republicans took their first step Thursday toward overhauling the federal safety net, pushing for new work requirements in the food-stamp program used by 42 million Americans. “The plan, introduced as part of the 2018 Farm Bill over objections of Democrats, would dramatically expand mandatory state workfare programs in the Supplemental Nutrition Assistance Program, better known as food stamps. Under the proposal, most adults between 18 and 59 will be required to work part-time or enroll in 20 hours a week of workforce training to receive assistance. The plan budgets $1 billion per year to fund the training program expansion. Ms. Dewey explained, “The bill, slated for markup in the House Agriculture Committee on April 18, launches the first major skirmish in Republicans’ push to overhaul welfare and nudge recipients closer to self-sufficiency through work. “House Speaker Paul D. Ryan (R-Wis.) and President Donald Trump have vowed to tighten work requirements in a range of welfare programs, with the president directing federal agencies on Tuesday to conduct a broad review of welfare work rules. Bloomberg writer Alan Bjerga reported on Thursday that, “The legislation, which would triple federal funds sent to states for employment and training programs while tightening eligibility rules for recipients of Supplemental Nutrition Assistance Program benefits, wouldn’t cut overall spending on the program. Overhauling welfare, a long-time GOP goal that’s on the wish list of retiring House Speaker Paul Ryan, has stalled in Congress this year, though efforts to increase work requirements in programs such as Medicaid continue. Eleven GOP Members of the Ag Committee spoke in favor of the SNAP provisions on the House floor on Thursday afternoon (Congressional Record transcript here). 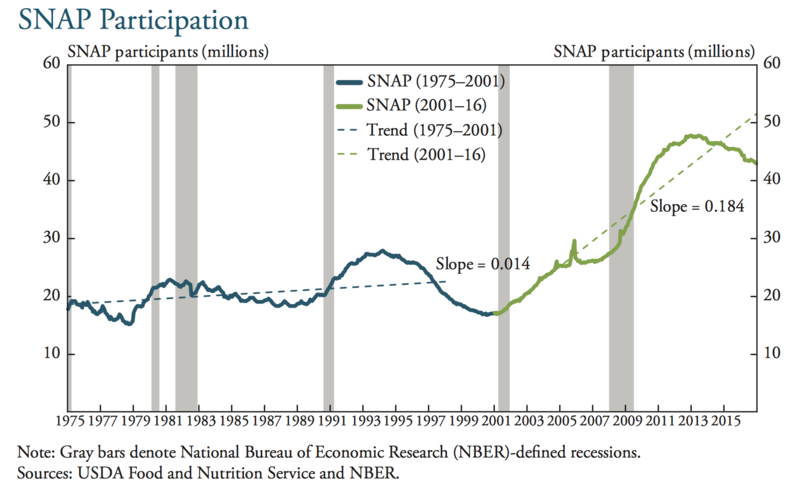 “[This chart] shows overall participation in SNAP from 1975 to 2017. 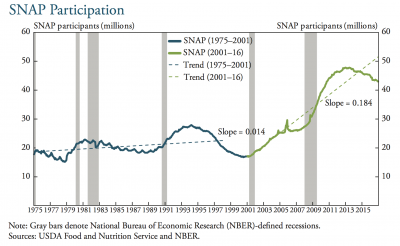 From 1975 to 2001, SNAP participation increased, on average, by 14,000 per month. But starting in 2001, participation increased by an average rate of 184,000 per month. The rate of increase accelerated during the Great Recession and early recovery.” (“Structural and Cyclical Trends in the Supplemental Nutrition Assistance Program,” by Kelly D. Edmiston. Federal Reserve Bank of Kansas City (March 29, 2018) (https://goo.gl/i1FckU). On Friday, House Ag Committee Ranking Member Collin Peterson (D., Minn.) spoke about the Farm Bill on the “Adams on Agriculture” radio program with Mike Adams. An audio replay of their discussion is available here (MP3- 7:30 minutes), and a FarmPolicyNews transcript can be read here. These are a bunch of ideological zealots, is what they are, and I’ve had it. You know, there’s half of this SNAP stuff I actually supported, and could have supported, but they put this poison pill in there. They’re going to spend $13 billion on programs that are not going to work. It’s a complete waste of money. And this is the people that are supposedly against more government. And then they’re claiming that this how they’re, now they’re strengthening the program. I mean, give me a break. You might as well take that money and burn it. Rep. Peterson also noted that he had not spoken with Chairman Conaway for four weeks. 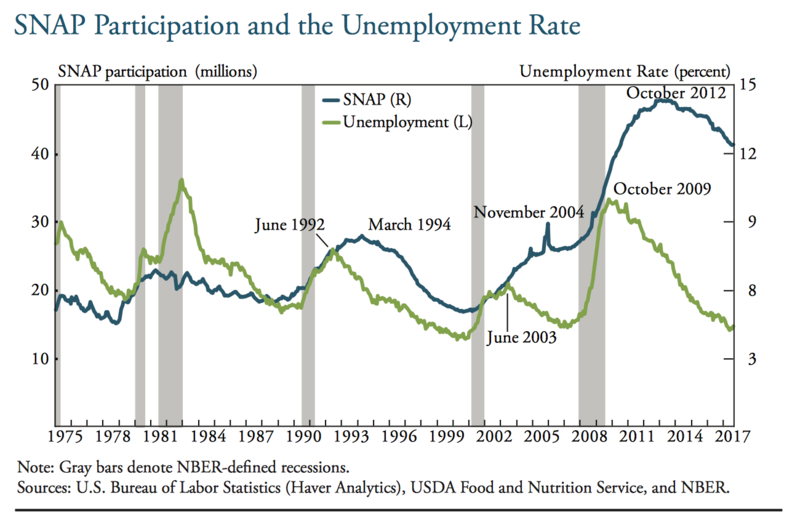 “As SNAP is a social safety net, participation would be expected to rise when unemployment rises. 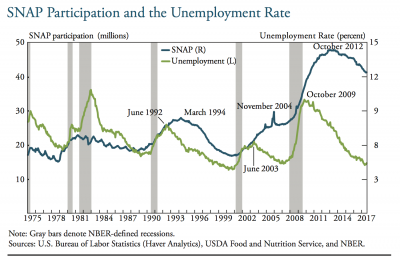 Likewise, SNAP participation would be expected to fall when unemployment declines. For the most part, this is the observed relationship, particularly during recessions—though in general, SNAP participation does not peak until months after the unemployment rate peaks. [This chart] shows that this lagged relationship holds in expansions as well: although the unemployment rate began to fall in October 2009, SNAP participation did not begin to tick down until October 2012.” (“Structural and Cyclical Trends in the Supplemental Nutrition Assistance Program,” by Kelly D. Edmiston. Federal Reserve Bank of Kansas City (March 29, 2018) (https://goo.gl/i1FckU). Meanwhile, the Associated Press reported Friday, “The chairman of the House Agriculture Committee said Friday that he ‘generally opposes’ drug testing for food stamp recipients. Last week, the House Agriculture Committee continued laying groundwork for the next Farm Bill by holding a Subcommittee hearing covering conservation issues. Low Farm Prices Impacting Ag Economy– Will Executive Branch Trade Policy Help?